I made dinner. It was daylight so I quickly snapped some photos while my toddler sat there angrily smacking his lips at me. Hi. This is my life. My son is a hungry little hippo who insists upon eating any and all food he sees, especially meatballs because he loves them. So I decided speedy photos were better than none and took these because GOSH DARN IT I OWE YOU ALL A RECIPE. And it's a good one, guys. You're gonna love it. They're yummy. They're flavorful. They're pretty darn easy (thanks to our lovely friend the slow cooker--I know pressure cookers are like the big thing but don't even talk to me about them because I am TERRIFIED of them so I'll just live with the sweet torture that is the low and slow cooking machine. Luckily-this recipe only cooks for like 2.5 hours!). The meatballs are super tender and delicious and the gravy is creamy and has sour cream in it so you know that equals pure YUM. 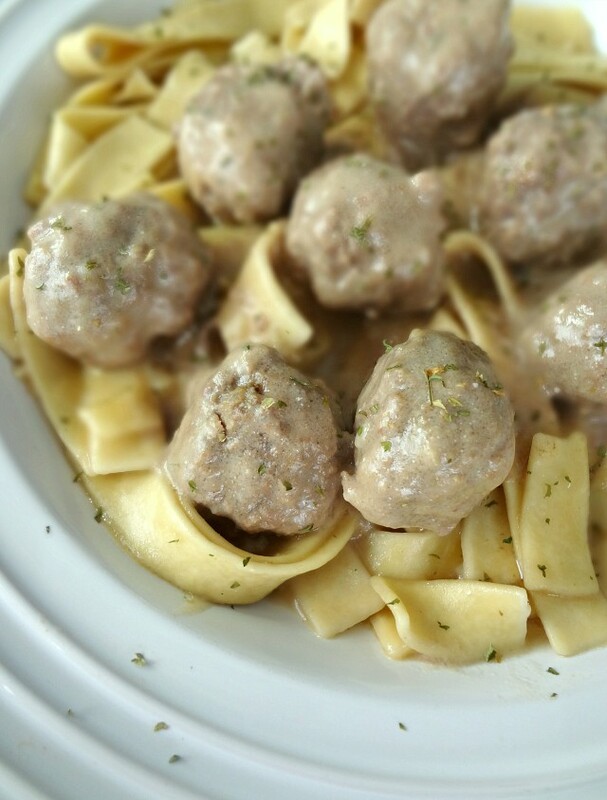 Just serve them over mashed potatoes or egg noodles and enjoy pure comfort food. Pour broth and 1 tbsp. Worcestershire sauce (if using) into 6 quart slow cooker. In a large bowl stir remaining 1 teaspoon Worcestershire sauce (if using), ground beef, breadcrumbs, salt, onion powder, pepper, milk and egg together until well mixed. Use hands to shape into small 1 inch balls (about the size of a walnut) and place in slow cooker in single layer (fill the bottom then, if needed, do a second layer around the edges of the cooker). Cover and cook on high for 2 hours. 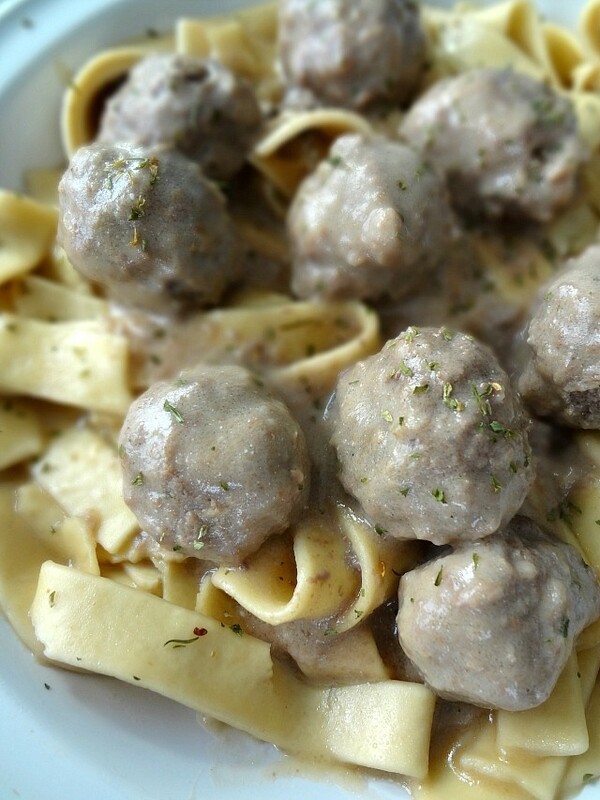 Use a slotted spoon to remove cooked meatballs. Whisk butter, flour, and sour cream into the cooking liquid in cooker until combined. Cook uncovered on high for 30 minutes, or until thickened. Put cooked meatballs into the gravy and stir to coat. Serve warm over mashed potatoes or noodles! Store leftovers in an airtight container in the refrigerator for up to 5 days. 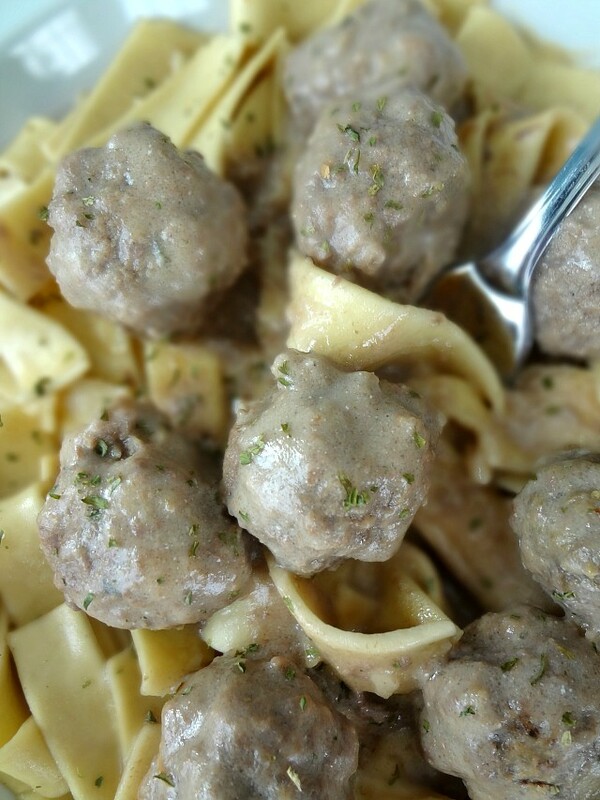 To freeze for later: After cooking the meatballs, use a slotted spoon to move them to a freezer safe airtight container. Let them cool completely at room temperature-then freeze. If you want to save the cooking liquid for making gravy-let it cool to room temperature then pour into a freezer safe airtight container. Should keep in the freezer for up to 3 months. As you gaze at these, just imagine the cutest boy in the world happily exclaiming "MEA-BAWLL!" 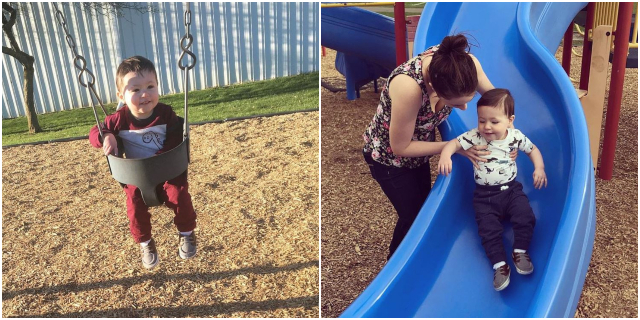 This week has been so lovely-the weather has gotten nice so Michael and I took James to the park twice (his first time!) We're lucky and there's a park across the street from our neighborhood allotment so we're able to just walk over with the stroller and he can swing or we can help him go down the slide. Little man loooves it, and we've been playing outside a lot in general. It's been so so nice. I worked today but tomorrow Michael and I are going to get some brunch together and maybe run an errand while James naps. I can't wait! PS-I'm planning on having a new recipe for you guys this week! Cross your fingers that I'm able to actually get it written and posted! Jane the Virgin-NOOOOOO *sob* I have never been upset for a fictional amnesiac character to get their memory back but I am this time. Gosh darnit c'mon, give poor Rafael a break! Queer Eye-Just finished season 3 and oh man. Still so good. Love it love it.